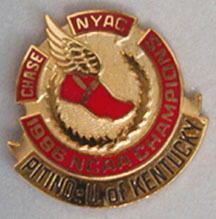 A limited edition press pin from 1996 honoring Rick Pitino and the University of Kentucky on their NCAA victory. Commissioned by Chase and produced by Balfour, only 300 of these pins were made. They were distributed at a New York Athletic Club dinner after the NCAA tourney. A great gift idea for any U of K fan, and a must for the press pin collector. Only 300 pins produced.